The interest payment burden on South Korea's lowest income households surged 33 percent on-year in the first quarter of 2018 amid a drop in their earnings, official data showed Sunday. According to Statistics Korea, households with two members in the bottom 20 percent earnings bracket earned 8 percent less in the January-March period while the country's interest rates moved upwards. Such developments are exacerbating the already tough debt service obligations of these households. Lower income and the rise in borrowing rates are fueling concern that those in the first quintile could become marginal households, thus adversely affecting consumption that is critical to sustainable growth. Marginal households are those whose debt exceeds their assets and who spend a considerable percentage of their disposable income on covering their obligations. The latest government statistics showed that, on average, those in the lowest income tier spent 42,200 won ($40) per month to service their debts in the first quarter, up from 31,800 won from a year earlier. The total, which does not count repayment of loan principal, is the highest amount since such data started to be compiled in 2003. On the other hand, earning for these households stood at little over 1.28 million won on a monthly basis, down 8 percent from the previous year. The government's statistics office also said that those in the second quintile -- with average earnings in the 21-40 percent range -- saw their earnings fall 4 percent on-year, while their interest payments rose 27.3 percent to 70,900 won per month. The official numbers also showed that top 20 percent of households reported a 9.3 percent increase in earnings in the three months ending March 31, although their interest burden rose by 20.2 percent to 156,000 won. For the whole country, the average amount spent on paying back interest on loans stood at 95,600 won, a rise of 23.1 percent, while income moved up 3.7 percent to little over 4.76 million won. "The numbers clearly show that there has been a steady rise in the country's interest burden that affected all households and that the rate of gains in repayment outpaced earnings in the three-month period," an official source said. He said the interest payment burden for the whole country is the highest it's been since reaching 96,500 won in the third quarter of 2012. "Even taking into account inflation, outlays on servicing real debt rose 21.6 percent compared to a 2.4 percent gain in earnings," the insider said. 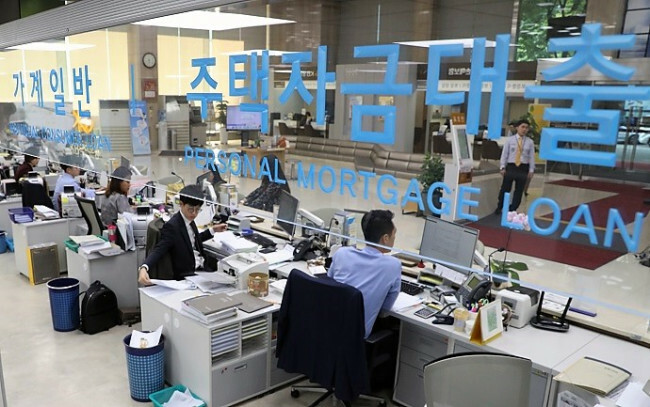 The Bank of Korea said earlier that the average borrowing rate was 3.46 percent in the first quarter -- the same as in the third quarter of 2015. It said, however, that people were paying more to service their debt because borrowing had increased. Total household debt reached 1,387 trillion won in the January-March period, the numbers having risen steadily for years. Related to the rise in debt service payment, think tanks like the Hyundai Research Institute, said that for the most part the country's debt payment obligation is more than manageable for many people at present. It noted that this may not be the case for lower income households, however. Market data has shown that for the lowest income households with debt, debt obligations exceeded 60 percent of their disposable income, up 20 percentage points from just a year ago.